We love indulgent result driven facials. We're passionate about active tailored skincare. We pride ourselves on great shellac, manicures and pedicures. We do everything with care and attention to detail, whether it's body treatments, waxing, tinting or spray tans. Give your skin the love it needs with the “Hydrate me Payot” facial! Relax with this 60 minute treat that includes a revitalising peel and mask. Available during April for $89! The Enhance team is passionate about skin care and always strives to provide great results that make you feel happy, youthful and confident in your own skin. Salon Director, Amy Parker-Hill, has created a beautiful space of warmth and harmony that aims to nurture our clients from the moment they walk through the door. Our values form an integral part of the business and are what make Enhance different to other salons. We pride ourselves on our professional attitude, our eye for detail and being attentive to your every need. We care deeply about our clients and always strive to build strong, ongoing relationships to bring out the absolute best in you. Our tailored skincare treatments are high performance and focus on results. We are passionate about enhancing the health of your skin and addressing concerns such as premature ageing, dehydration, pigmentation, acne and sensitivity - boosting your confidence and enhancing your natural beauty, not covering it up. Everyone’s skin is different therefore all our facials begin with a thorough skin analysis and the development of a treatment plan drawing from our range of professional skincare products, intensive peels, facials and modalities; including microdermabrasion, Dermapen and Pellevé. At the conclusion of your treatment, you will receive post-treatment advice from your therapist who will also guide you through our cosmeceutical skin care range. Great skin comes from taking care of and investing in yourself, and you will get the best results from a series of treatments. We list prices for our facial treatments when purchased individually (1), or when purchased as a series of three (3) treatments. Whether you’re new to skincare or looking to step up your skin health look no further - your expert advice is here. This introductory facial begins with a cleanse allowing an experienced therapist to perform a detailed analysis of your skin identifying problem areas and developing a tailored treatment and skin care plan. After applying a hydrator and SPF, your therapist will walk you through your treatment plan explaining the different cosmeceutical skin care products and treatments recommended for your concerns, and how they will benefit your skin. Walk away with your new routine in the bag! You can redeem the price of this treatment against skincare product purchased over $100 in the same transaction. Our pamper facials are suitable for all skin types and are the perfect treat for any stage of your skincare journey. Refresh your skin with our express facial. Your skin will be thoroughly cleansed and exfoliated finishing with a targeted serum and hydrator. Includes a scalp massage. Indulge and relax while our signature facial infuses your skin full of vitamins, peptides and antioxidants leaving it firmer, brighter, hydrated and glowing. Your therapist will select from our range of specialised masks and serums customising this treatment to your skin. Includes an indulgent massage. If you are looking for a change or to treat a specific concern our foundation corrective facials are the first step on your journey. Refresh your skin with our express peel, the perfect facial for maintenance or in-between more intensive treatments. Your skin will be thoroughly cleansed and exfoliated to ensure the best results from your targeted treatment peel, then finished with a serum and hydrator. Improve the texture and appearance of your skin. Your facial begins with a deep cleanse and exfoliation using a specially designed Au Vin exfoliating treatment, infused with lactic and salicylic acid, to reduce the look of fine lines and wrinkles. The gentle exfoliation continues with the application of an AHA peel derived from French Chardonnay grapes. These grapes undergo a fermentation process to produce highly refined AHAs that renew and rejuvenate resulting in smoother, radiant looking skin. Suitable for most skin types except the most sensitive this exclusive Luzern facial is a must have for dry, dull or mature skin. Specially designed for the most sensitive and impaired skins this gentle facial will help reduce redness, restoring the function of your skin allowing it to stay hydrated and calm. Includes an indulgent massage. Designed for those who are battling pimples, acne and blackheads this facial will help clear congestion, hydrate and soothe aggravated skin. Your 30-minute facial concludes with one-on-one instruction on how to use the included O Cosmetics skincare kit - everything you need to start a targeted cosmeceutical skincare routine at home ($99 value). Our Clarity Starter facial is a great place to start when building up your skin for our Clarity intermediate corrective facial. Don’t let the ladies have all the fun! Whether you’re a surfer, tradie or work indoors, this facial will address dryness, dehydration and dullness giving your skin the attention it requires. The treatment begins with a thorough cleanse and exfoliation to remove dead skin cells allowing for easier removal of blackheads and effective application of a targeted serum. Includes a peel if your skin is up to the challenge. If needed this facial can be upgraded with a brow tidy for $20. Light therapy stimulates your skin through the application of light energy at specific therapeutic wavelengths designed to either treat a specific skin concern (such as acne), or be converted into cellular energy used in the production of collagen and elastin. This 15 minute light therapy treatment includes a thorough cleanse and exfoliation to prepare your skin, and finishing products after your treatment preparing you for the rest of your day. Microdermabrasion is a painless and non-invasive exfoliation treatment that stimulates your skin, improving skin health, texture and promoting skin rejuvenation and cell renewal. Our microdermabrasion facials will leave your skin noticeably smoother and glowing. Suitable for all skin types including sensitive. Our express microdermabrasion facial includes a thorough cleanse, a single pass of diamond microdermabrasion and a gentle enzyme peel mask. Our advanced microdermabrasion facial builds on our 30 Minute Micro with multiple passes of diamond microdermabrasion, a gentle enzyme peel mask and indulgent massage. Retexturise and stimulate your skin with our powerhouse signature microdermabrasion treatment targeting the face, neck and décolletage. Includes a thorough double-cleanse, exfoliation, lymphatic drainage, microdermabrasion, layered peel, hydrating mask and indulgent massage. Continue on your journey to great skin with our intermediate corrective facials recommended for those who have built up their skin and are ready to take their skin to the next level. Fight back against breakouts and congestion! This skin-saving facial will remove excess oil, hydrate and soothe blemished and inflamed skin. Suitable for all skin types especially oily and congested skin. Diminish fine lines and wrinkles with this specialised facial designed to return your skin to its smooth and silky state. Includes an anti-aging peel, Luzern WE3 serum (the “Wrinkle Eraser”) and Firming collagen sheet mask. Infuses antioxidants and peptides helping your skin retain elasticity and firmness. Suitable for all skin types including sensitive. This super brightening facial uses a high strength Vitamin C and Peptide peel especially for pigmented, dull and uneven skin tones. Includes high antioxidant brightening and collagen building serums to promote a uniform complexion. Perfect for all skin types particularly hyperpigmented melasma age spots and freckles. These treatments are designed for clients who have progressed on their skin journey and have been maintaining cosmeceutical home care products for some time. These advanced peels may attract mild peeling for 3-5 days post peel, then reveal a new refreshed skin underneath. Designed for those who are serious about lines and wrinkles this advanced Vitamin A anti-aging facial is suitable for those who are already using retinol as part of their home skincare routine. Concentrated levels of pure Retinol and encapsulated Retinol, Niacinamide and Natural Fruit Acids work together to counteract skin aging, improve the appearance of UV damage, normalise keratinisation, refine and resurface the skin, even out skin tone and provide potent anti-inflammatory activity in even the most weakened skins. Perfect for oily, problematic skin that is in need of extreme exfoliation this peel is not for the faint-hearted and not before a special occasion. This fantastic treatment uses intense concentrated levels of lactic acid, AHAs, salicylic acid and niacinamide to offer exclusive Biomimetic desquamation which seriously rejuvenates the skin, reduces fine lines and uneven pigmentation, improves skin smoothness, clarity and radiance for a brighter, smoother and more even-toned skin complexion. Boost your facial by incorporating a 15 minute light therapy treatment giving your cells energy to repair, renew and produce collagen and elastin. Boost your facial by incorporating a 30 minute light therapy treatment giving your cells energy to repair, renew and produce collagen and elastin. Add Microdermabrasion to your facial. Microdermabrasion is a painless, non-invasive exfoliation treatment that improves the health of your skin promoting cell renewal and boosting the effects of your facial. Intensely hydrates the delicate eye area removing puffiness, lightening dark circles and reducing the appearance of fine lines and wrinkles. Boost your exfoliation with this specialised treatment infused with Lactic Acid and Salicylic Acid. Instantly firms the skin, hydrates and plumps lines. Peels can be added or layered in most facials, discuss the suitability with your therapist. Our advanced corrective treatments are designed to engage and support the natural healing and repair responses in your skin. As a result of this the results always look natural - like turning back the clock. These treatments are non-surgical and non-invasive - there are no fillers or artificial substances inserted into or added - just your own skin looking naturally healthy, and you looking your best and feeling confident. Whether you are treating a specific concern or looking to reduce the signs of ageing, these treatments combined with a tailored cosmeceutical skin-care routine can keep your skin healthy and looking great avoiding the need for more invasive treatment options in the future. To find out more about how our Advanced Corrective Treatments work to keep your skin healthy and youthful, and what you can expect book a free consultation and read our Anti-Aging Treatments Explained page. A therapist will guide you through the different anti-ageing treatment options available and discuss what results you can expect from a Dermapen or Pelleve rejuvenation treatment. Pellevé is relaxing treatment which uses radio-frequency energy to gradually heat the dermis. This controlled application of heat deep into the skin causes collagen to contract and re-form, and triggers the production of new collagen and elastin firming, smoothing, plumping and lifting reducing the appearance of lines. The healing and repair response producing new collagen and elastin continues to improve the appearance of your skin for 6 to 12 months post-treatment continually building and strengthening. Suitable for your lunch break and amazing the day before your big event. The Pellevè rejuvenation treatment is non-ablative, meaning it does not penetrate or damage the surface of your skin like IPL, Laser and needling treatments. As such this treatment is painless, and has no downtime post-treatment - walk out the door with smoother, tighter and lifted skin. In addition to treating symptoms related to ageing (such as fine lines and wrinkles) this advanced micro-needling treatment also improves your skin’s texture and can treat scars, acne scars, sun-spots, pigmentation, enlarged pores and stretch marks. By creating vertical micro-channels at controlled depths the Dermapen minimises unwanted damage to the epidermis minimising downtime. Beware of imitation, we use genuine Dermapen TM hardware and single-use consumables in all our treatments allowing us to achieve the best results from quality and proven technology. Prices are listed when purchased individually (1), or when purchased as a series of three (3) treatments. Our deluxe manicure includes hand soak, trim and shape, cuticle work, buff, indulgent sugar scrub, massage and mask. Finished with a choice of polish (60 Minute). Our deluxe pedicure uses a professional foot peel to give you smooth, beautiful feet. Includes nail trim and shape, cuticle work, buff and foot rasp finished with a foot and leg massage and your choice of polish (60 Minute). Replace polish with CND Shellac application in your Enhance Signature Manicure or Enhance Signature Pedicure. Includes trim and shape, cuticle work, buff and your choice of polish (30 Minute). Using genuine CND Shellac and OPI Gel Colour our Shellac manicure provides strength and lasting shine for 2 to 4 weeks. Includes trim and shape, cuticle work and buff (45 Minute). Our Shellac Manicure with removal of existing Shellac (60 Minute). Our Shellac Pedicure with removal of existing Shellac (60 Minute). At Enhance we use high quality wax products for exceptional results. All waxing is performed by qualified therapists in a warm and friendly environment and includes a soothing post lotion. This long-lasting treatment keeps your lashes positioned perfectly meaning you can say goodbye to your curlers. Includes a lash tint, eye mask hydrator and an indulgent scalp massage. Enjoy a blissful escape. A Swedish relaxation massage will calm your nervous system and promote a sense of relaxation and well being, reducing anxiety and tension. Spoil yourself or someone special with a gift voucher! A Swedish relaxation massage will calm your nervous system and promote a sense of relaxation and well being, reducing anxiety and tension. Inika mineral cosmetics use only the finest natural ingredients sourced from Australia and around the globe. They are 100% vegan, certified organic and packaged using recycled materials. Incredibly easy to use, they stand up to heat, humidity, and perspiration providing a beautiful natural look and great coverage. Whether you are starting from scratch, wanting a new look or after tips to apply your makeup so that it lasts all day, this 60-minute one-on-one tutorial will leave you with the knowledge and confidence to get the look you’re after (60 Minute). We love O Cosmedics because their range of highly active products give your skin a workout with great results. Youthful, healthy skin requires daily commitment partnered with superior formulations. When you give your skin daily attention with O, you’ll benefit from the purest combination of medical grade ingredients and cosmetic science blended harmoniously with nature. It’s skin care integrity at its best that delivers a staggering list of benefits you’ll wonder where they’ve been all your life. We love Luzern because their products are gently active and luxuriously effective promoting optimum skin health. The Luzern line is the ideal choice for people who want luxurious and pure skin care but do not want to sacrifice results. We love Inika Organic cosmetics because they are incredibly easy to use, they stand up to heat, humidity and perspiration providing a natural look and great coverage. Our appointment times are limited, especially on popular days. In order to service all our valued clients, we require a 50% deposit to secure bookings. 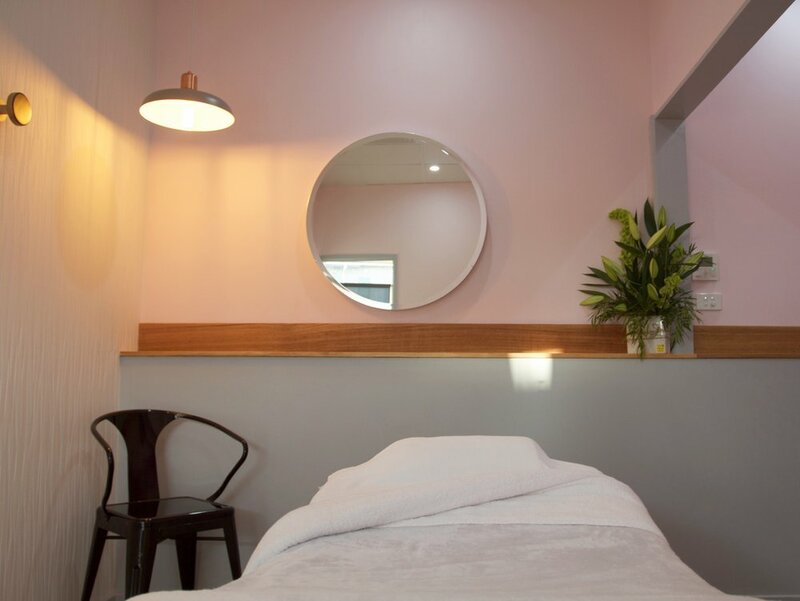 If you are booking online and using a gift voucher or prepaid treatment concession you must still leave a 50% deposit which will be refunded after your appointment, alternatively you can call us on (03) 5249 5747 to use the value of your gift voucher for your deposit. If you need to cancel your appointment and would like to keep your deposit you must reply to the automatic confirmation SMS message, or advise us over the phone 24 hours before your appointment is scheduled. Our phone number is (03) 5249 5747. Cancellations are not accepted via social media. We do not add a surcharge on public holidays, however when we are open on a public holiday we reserve the right to request a 100% deposit on any appointments. This deposit is forfeited in the event of the appointment being cancelled or postponed less than 48 hours before it is scheduled, or if you do not attend.